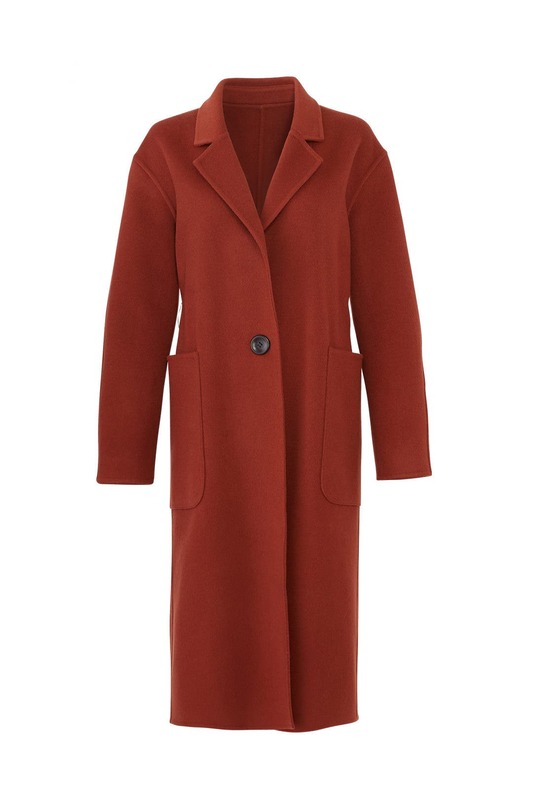 An oversized wool coat from Becken features an effortlessly luxe layer to throw on. Red wool felt (100% Virgin Wool). Coat. Long sleeves. Exposed front button closure. Pockets. 44" from shoulder to hemline. Made in the USA. Wanted to love this coat so bad as it is a gorgeous color and feel and came with the tag still on. I'm a taller gal (5'7) and this was swimming on me. I understand oversized but this was a little too oversized for my liking. The XS fit my boyfriend at 6'1 great! It's a beautiful color and the material is of the highest quality. It is definitely a very warm coat but unfortunately it just did not fit nicely at all. 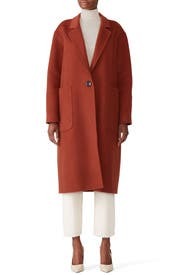 Oversized is an understatement and the fit just seemed "off" in terms of both measurements and how the cut of the coat. Loved this coat, but I didn't make it to the event I rented it for. It is a rich fall color and has beautiful lines, but just too much for regular Texas weather. I'm returning with the tags still on so someone else can enjoy this winner! I'm usually a size medium, but this small was plenty big enough for me, even with a sweater underneath. It's a nice oversized coat with a clean look which made it suitable to wear to the office as well. The colour is beautiful and i got lots of compliments. Perfect coat for autumn. Loved the Coat. It was to big through arms and shoulders. I think it would work on someone taller. The oversize look just didn't work for me. Very stylish coat that will get eyes turning. Only problem is that it runs very large. The small was huge on me. Gorgeous color, tons of compliments, classic shape. I love this coat. The fabric is extremely luxurious. The color is gorgeous. Easy to wear with sweaters, etc. I am tall, and I think that is what makes it work. I would not recommend this to someone who is petite or even average height. The fabric is gorgeous, but it is unlined and that made taking it on/off a little challenging. I wore it once and returned it before the day was over, and this was after trying the XL, which was just way too big. Perhaps this is best for really tall, really thin people. Love this coat! Beautiful fall color and not itchy at all. Wore it with the belt one day and without the belt the next--- looks good either way. Lightweight but fairly warm!! Got lots of compliments on it too! 10/10 rental. Sized down to a Medium and was still drowning in this. The oversized style doesn't work on my frame (I have a full bust and an hourglass figure) but might work for someone with a more straight frame if you size down two sizes. It's a very "boxy" coat. I would go with a smaller size. It's a beautiful color and fabric. I did not get to wear this as it was too large. I ordered the medium and it felt like an XL. I tried cinching it with the belt it came with, but it looked strange. Maybe the small would have been better. It is a very large coat, I loved the color, but it swallowed me. Beautiful coat. Awesome color. HUGE. . I rented this coat to wear everyday to work. 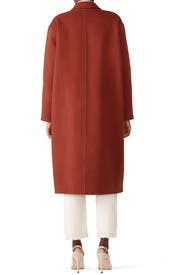 It's a beautiful coat- soft material, nice color, but it is cut extremely oversized and boxy. I'm normally an 8, so I ordered the M, but it was so big I feel like I could have used an XS. 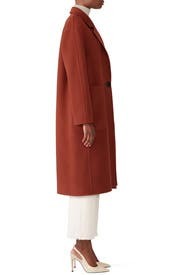 Trust all of these reviews when they say this coat this is absurdly big, and not in an "I'll look little and cute in this and everyone will know it's meant to be oversized" kind of way. But more in an "this is just really bad sizing by the designer" kind of way. I'm 5'9 and wear a size 8, the medium I ordered would have have been fitted on someone 3x my size. I think I would have needed and XS for this to even make sense. It's a beautiful color and material, but I swam in it! It's boxy, which I typically like, but it's built for a woman with a bigger frame than me. There's a belt included, but it makes the the bucket pockets jut out and look awkward. Really liked this coat! After reading reviews, I sized way down... I'm 6 months pregnant with twins and got a small, and it's still roomy. Didn't come with belt, but I will definitely wear a lot! Loved this coat! Super cute and went with everything I wore this winter. It is a bit itchy at times like when I wore stockings but otherwise it is a great fit and makes you feel fabulous. 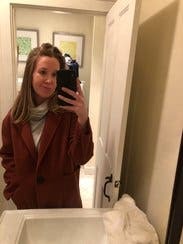 I loved this coat but thought it was an overcoat but when it arrived I realized it was actually a thick, heavy winter coat. This wasn't what I was looking for but the coat was cute on. Make sure to size down! I ordered this coat in an extra small and I was swimming in it. It looked like I was wearing a men's XL bath robe. Not a fan of this coat. Also, the fabric seemed cheap and it felt very worm. Beautiful rust color. Soft fabric. I wore an XL it was cute but really big. I ended up keeping it almost two weeks lots of compliments. Great for spring in SF. Cute jacket, but nothing to go crazy over. Fits super large so size down.